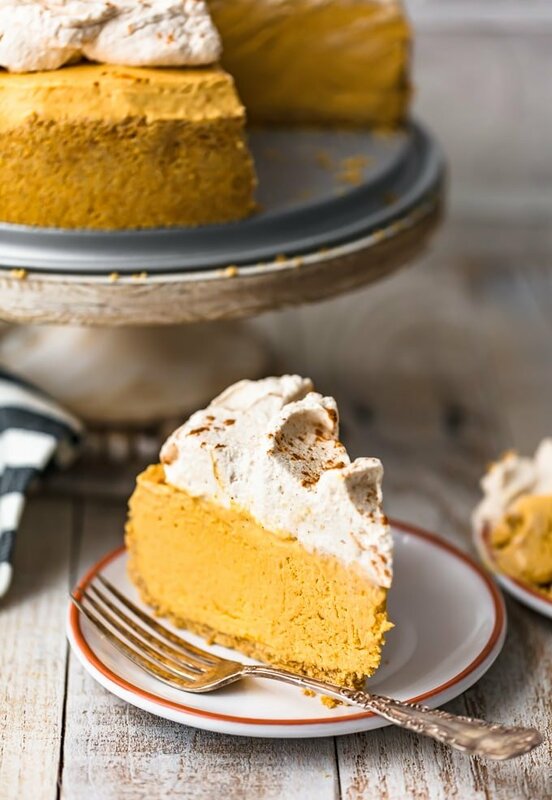 Pumpkin Pie Cheesecake is the perfect fall dessert, made with a graham cracker crust and topped off with pumpkin spice whipped cream. 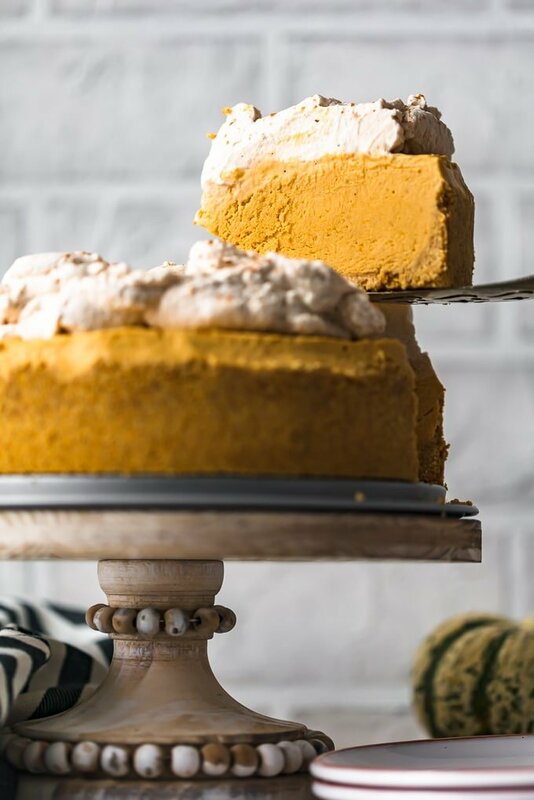 This no bake pumpkin cheesecake recipe is so easy to make. You definitely want this at your holiday feast! 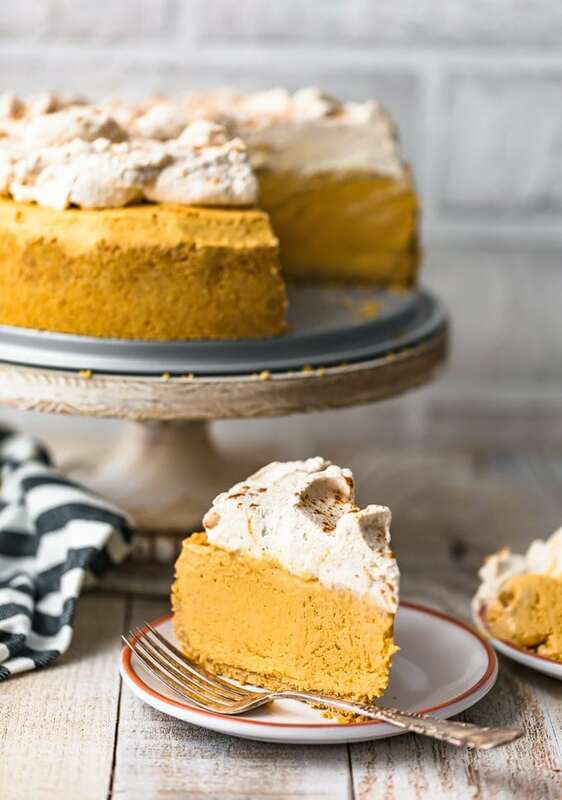 Pumpkin Pie Cheesecake is a fun pumpkin dessert that everyone will love. Find out how to make this easy no bake pumpkin cheesecake recipe! 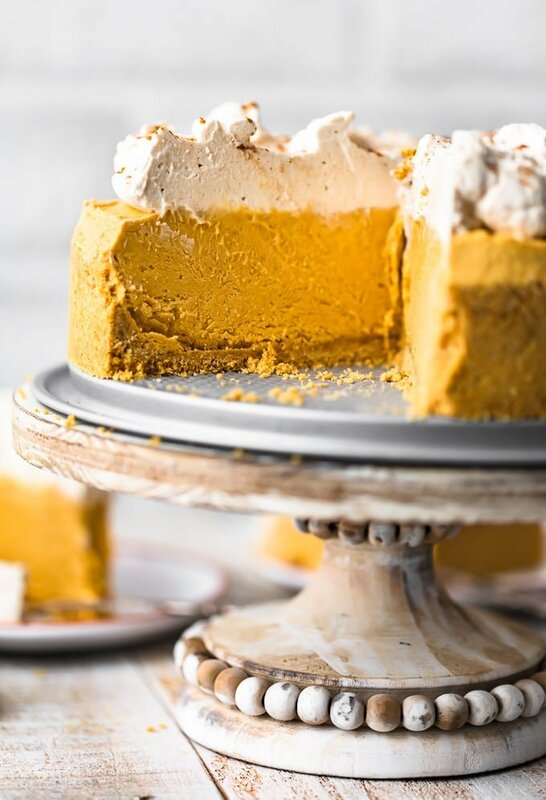 Pumpkin Pie is a classic holiday dessert, and I’m always trying to take that flavor and create something new and fun to share with family, friends, and holiday guests. This year, that means a Pumpkin Pie Cheesecake! 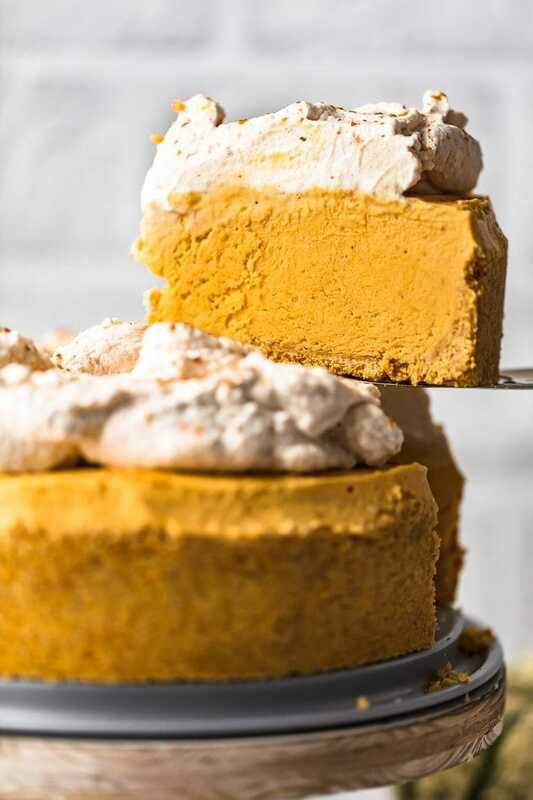 This No Bake Pumpkin Cheesecake Recipe is sooo delicious. It’s the perfect cheesecake texture (light and fluffy), yet so full of rich flavor. The no bake part means you get to deal with your refrigerator instead of your oven. If you’re anything like me, that’s really good news! This easy pumpkin cheesecake recipe mostly just requires mixing, filling, and setting. So simple! I just love this recipe for Thanksgiving. 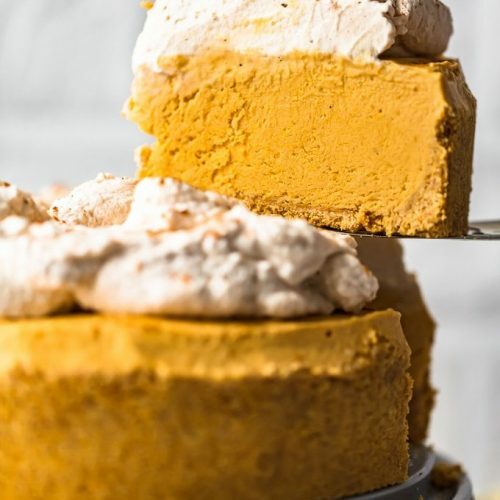 Pumpkin Pie Cheesecake should be your next pumpkin flavored dessert. It’s easy, delicious, and so festive! NO BAKE is my favorite phrase when it comes to desserts. Baking still makes me nervous (yes, still), so if I can get an amazing dessert without turning on the oven, I’m all for it! Every part of this no bake pumpkin cheesecake recipe is made without heat. Really! The crust, the filling, and the whipped topping are all just a matter of mixing and cooling. You do have to have some patience with this no bake dessert, since the cooling and setting part takes hours. BUT it’s so easy. You can prepare this well ahead of time, set it in the fridge, and not think about it until it’s time to serve. 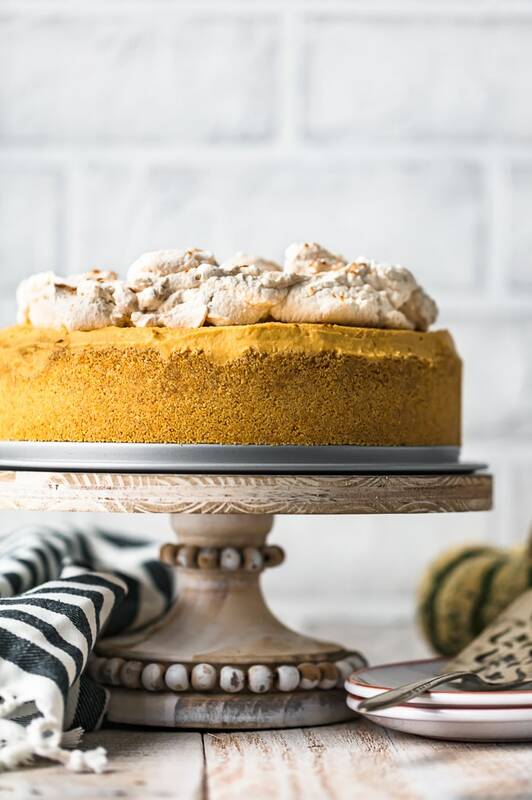 I made a simple graham cracker crust for this pumpkin pie cheesecake. All you have to do is crush up some graham crackers, mix the crumbs with butter, mold it into a pie plate, and then let it set in the refrigerator. It’s the perfect crust for pumpkin cheesecake and adds just the right flavor! You will need to prep this crust at least a few hours before you start on the cheesecake mixture, that way it has time to set before you fill it. 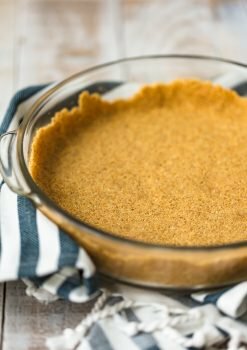 Learn how to make graham cracker crust here. The Pumpkin Spice Whipped Cream is the best way (the only way really) to top off this no bake cheesecake. It’s sooooo fluffy and delicious. The pumpkin spice flavor is just amazing, and it is a great complement to the cheesecake filling. Get the full recipe for the pumpkin flavored whipped cream recipe here. Our pumpkin cheesecake recipe is made in three parts: the crust, the filling, and the topping. We’ve gone over the graham cracker crust and the pumpkin whipped cream, so now let’s talk about the cheesecake filling! Beat together the cream cheese and powdered sugar until fully combined. Add in the pumpkin puree and pumpkin pie spice, and continue beating. Then add in the whipping cream and continue mixing, then beat on high speed until peaks form. Make the graham cracker crust FIRST, with plenty of time for it to set int he refrigerator. When the crust is ready, make the cheesecake filling (as outlined above). Pour the mixture into the crust. Spray a piece of plastic wrap with non-stick spray then use it to cover the cheesecake. Set the cheesecake in the refrigerator for at least 6-8 hours, or leave it overnight. 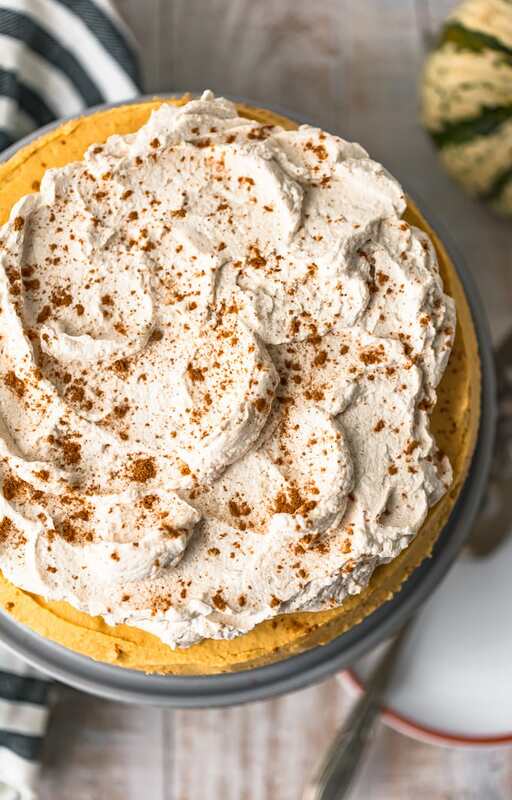 When the cheesecake is ready, make the pumpkin spice whipped cream. Take the cheesecake out of the pan and remove the plastic wrap, then slice and top with the whipped cream. While this definitely isn’t a “whip together at the last minute” kind of dessert (you’ll need to make it at least a day before), it still so simple overall to put this thing together. And it comes out so delicious. Check the recipe card below for full instructions. Since your no bake cheesecake is already cooled, you can easily prep it for freezing. To freeze the entire cheesecake, place it on a piece of cardboard, a baking tray, or something else sturdy. Place it in the freezer uncovered for a few hours until it becomes firm. Then you can wrap it in plastic wrap and aluminium foil (place that inside of a resealable bag for extra protection), and the place in the freezer. It will keep for a couple of months. When you’re ready to eat the pumpkin pie cheesecake, let it thaw in the refrigerator overnight before serving. How long does a no bake cheesecake last in the fridge? This no bake pumpkin cheesecake recipe will last in the refrigerator for about 4-5 days. If you don’t plan on eating it all within that time, consider freezing it (or a few slices of it) as outlined above. I hope you make this no bake Pumpkin Pie Cheesecake a part of your holiday celebrations this year. It’s such a delicious treat, something everyone will love! See the recipe card below for details on how to make No Bake Pumpkin Cheesecake. Enjoy! 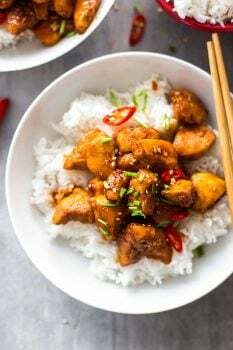 FIND ALL THE RECIPES YOU NEED WITH MY EASY HOLIDAY RECIPES E-BOOK. OVER 130 RECIPES IN ONE PLACE. INCLUDES APPETIZERS, SIDE DISHES, DESSERTS AND MORE! Prepare the crust per recipe directions. Combine cream cheese and powdered sugar in a mixing bowl and beat on low speed for 15 seconds. Set the mixer to high speed and beat until the sugar and cream cheese incorporate fully, about 2 minutes. Add the pumpkin purée, pumpkin pie spice and salt and beat an additional minute. Add the whipping cream and mix on low speed to combine. Increase the mixer speed to high and beat until stiff peaks form, 3-5 minutes more. Spray a piece of plastic wrap with nonstick spray, cover the cheesecake with the plastic wrap (sprayed side down) and place it in the refrigerator to set – between 6-8 hours (or overnight). Make the Pumpkin Pie Whipping Cream per recipe directions. Remove the cheesecake from the springform pan, remove the plastic wrap and cut the cheesecake into thin wedges. Serve each slice with a dollop of Pumpkin Pie Whipping Cream and a dash of pumpkin pie spice.